Fremont’s use of “at-large” elections violates state law, says a Southern California attorney who has successfully sued other cities by arguing the voting method has been shown to unfairly diminishing the chances of minorities, especially Latino candidates from winning elections. The complaint’s desired effect appears to be working. A Fremont staff report recommends city officials begin the process of shifting to district-based elections in coming years based, in large part, by a potential legal bill that could exceed $1 million. The complaint letter sent by Malibu-based attorney Kevin Shenkman last month asks the city to begin the switch from at-large elections to district-based system or face a lawsuit under the California Voting Right Act (CVRA). “Fremont’s at-large system dilutes the ability of Latinos (a ‘protected class’) to elect candidates of their choice or otherwise influence the outcome of Fremont’s council elections,” writes Shenkman. At-large elections allow a jurisdiction’s majority group to control every open seat, he adds. In his letter, Shenkman uses the most recent Fremont council elections and fourth-place finish of Latino candidate Laurie Manuel, and another in 2010 who also failed to win election. “In both instances, the Latino candidates received significant support from Latino voters, but fell short of securing a seat in Fremont’s at-large election due to the bloc voting of Fremont’s majority non-Latino electorate,” wrote Shenkman. Roughly 14 percent of Fremont’s population is Latino. In recent years, Latinos have historically been unsuccessful in gaining seats on the Fremont City Council, notes Shenkman, while adding cities as large as Fremont and its 230,000 population rarely use the at-large electoral system. 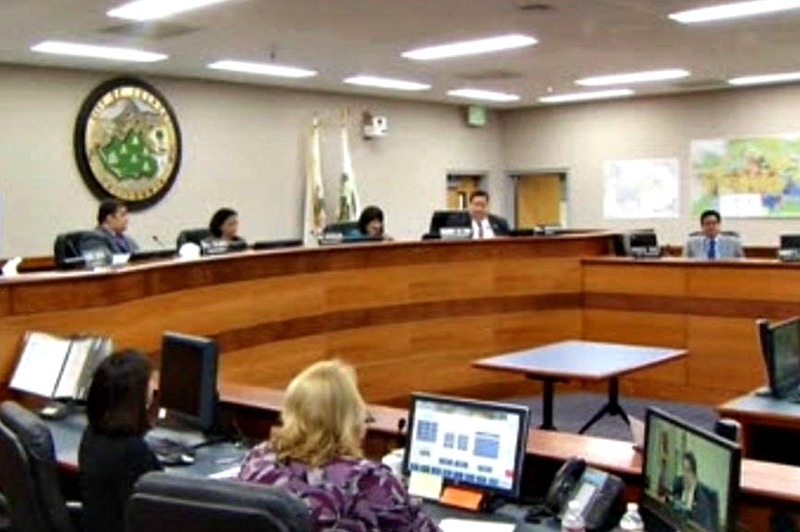 Fremont’s five-person city council is also small for a city of its size. By comparison, San Leandro with a population of 85,000 has long used a seven-person council, as does Hayward with 140,000 residents. In the East Bay, Alameda and Hayward use at-large elections to fill open seats on their city councils. For instance, during an election year when two council seats are up for grabs, under the at-large system. the top two finishers among a pool candidates win. Under district elections, the city is evenly divided among council seats and candidates from those areas meet in separate races. Fremont, though, may not have choice in the matter after city staff estimated the cost of defending its at-large voting system in court could cost up to $1 million. Making the switch to district elections would also have costs, although far less, according to the report. District elections would entail hiring political consultants and a demographer to equally divide Fremont’s four council seats, among other costs. Shenkman’s firm successfully sued the city of Palmdale over its use of at-large elections. The case cost Palmdale taxpayers $4.5 million to settle. In a separate case from 2015, Santa Barbara paid $900,000 in attorneys’ fees and other costs settle their CVRA lawsuit. “Staff makes this recommendation due to the extraordinary costs to successfully defend against a CVRA lawsuit and the fact that it appears no city has prevailed against a CVRA lawsuit,” according to the city staff report. A new state law that went into effective last Jan. 1 gives cities a 45-day window to respond to the type of demand letter Fremont received on Feb. 15. Under Assembly Bill 350, if Fremont declares intent to transition to district elections, another 90 days is granted and the potential plaintiff is prohibited from filing their CVRA lawsuit. On Tuesday night, Fremont appears likely to go this route following a Mar. 7 closed session where council direction was given for city staff to study the issue. Under the state law, five public meetings on the matter must also be held during the same 90-day time span. While Latino candidates in Fremont have been unsuccessful in winning elected office, the city’s large minority-majority of primarily Asian and South Asian residents have done quite well, as have women. However, the current Fremont City Council maintains a majority of three male Caucasians. Posted in Alameda, at-large elections, California Voting Rights Act, complaint, district elections, Fremont, Fremont City Council, Hayward, Kevin Shenkman, latinos, Laurie Manuel, legal claim, legal fees. Bookmark the permalink.